Robert McLeman, associate professor in Laurier’s Department of Geography and Environmental Studies, is the recipient of the fall 2015 Residence Academic Partnership Award. 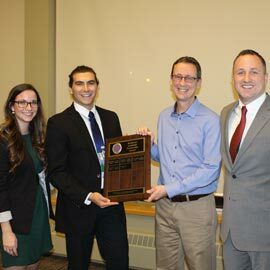 The award recognizes one faculty member each term that has gone above and beyond to support academic initiatives within the university’s residences. McLeman is the faculty advisor for the outdoor adventure Residence Learning Community (RLC) – a residence floor that connects first-year students with peers that have similar interests. During the fall term, McLeman led the outdoor adventure RLC students on interpretive nature walks and acted as a mentor during a camping weekend at Laurel Creek. This winter, he hopes to join the students on a snow shoeing expedition. Brandon Pludwinski, a third-year student in Laurier’s Global Studies program and don of the outdoor adventure RLC, commended McLeman for his enthusiasm and commitment to the students. McLeman believes the residence communities are important to the student experience as they focus on building community and provide students with unique experiences in their first year, which they often wouldn’t otherwise get.